Water pollution from surface coal mining has degraded more than 22 percent of streams and rivers in southern West Virginia to the point they may now qualify as impaired under state criteria, according to a new study by scientists at Duke and Baylor universities. The study, published this week in the peer-reviewed journal Environmental Science & Technology, documents substantial losses in aquatic insect biodiversity and increases in salinity linked to sulfates and other pollutants in runoff from mines often located miles upstream. They used NASA satellite images and computer data to map the extent of surface mining taking place across a 12,000-square-mile area of the southern West Virginia coalfields between 1976 and 2005. They found that companies had converted more than 5 percent of the land into mine sites and buried 480 miles of streams beneath adjacent valley fills during this period. 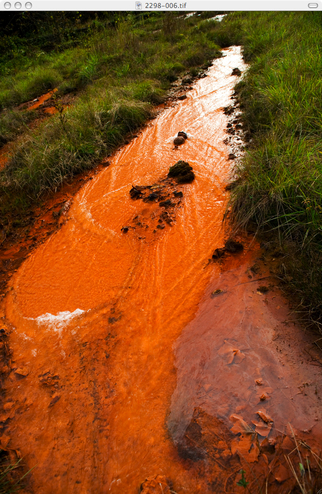 By overlaying the map with chemical and biological data from 223 streams the West Virginia Department of Environmental Protection sampled in the study area between 1997 and 2007, the researchers determined that pollution runoff from the mines could substantially degrade more than 1,400 miles of streams in the region – four times the length of streams buried below the valley fills. “It’s important to recognize that surface coal mining pollution doesn’t stop at mine-permit boundaries,” said Brian D. Lutz, a postdoctoral associate in Bernhardt’s lab. “Our analysis suggests that mining only 5 percent of the land surface is degrading between 22 percent and 32 percent of the region’s rivers,” he said. Substantial declines in insect diversity began to occur when companies had mined as little as 1 percent of upstream land, the analysis showed. In areas where companies had converted about 5 percent of the land into mines, sensitive species such as mayflies and stoneflies had vanished or declined to an extent that the streams would qualify as biologically impaired under criteria set by the state of West Virginia. The designation means the streams could be placed on a list of waterways that the state must take steps to rehabilitate. ← China’s environmental protests: simple NIMBYism or cutting edge people power? Reblogged this on Croatan Earth First!.